PUFFIN among more regular species. These species were seen from a cruise ship, as we are learning is typical far offshore from mid-April to mid-May. We already have a 10 hour pelagic trip set up for May 5th. Even with this slower charter fishing boat, we can still reach 45 miles offshore and spend over an hour there in a 10 hour trip. One of the Murphy's Petrels was off Lane County and one off Lincoln County in the 2 hours the cruise ship was off these counties late in the evening (eBird data). Most of the good birds from the Rare Bird Alert were seen about noon in southern Oregon, only 20 miles offshore, but still in 500 fathoms of water (3000 feet deep), as the cruise ship traveled on the 125 degree W longitude line. Our pelagic trip is in Lincoln County quite near the Lane County border. 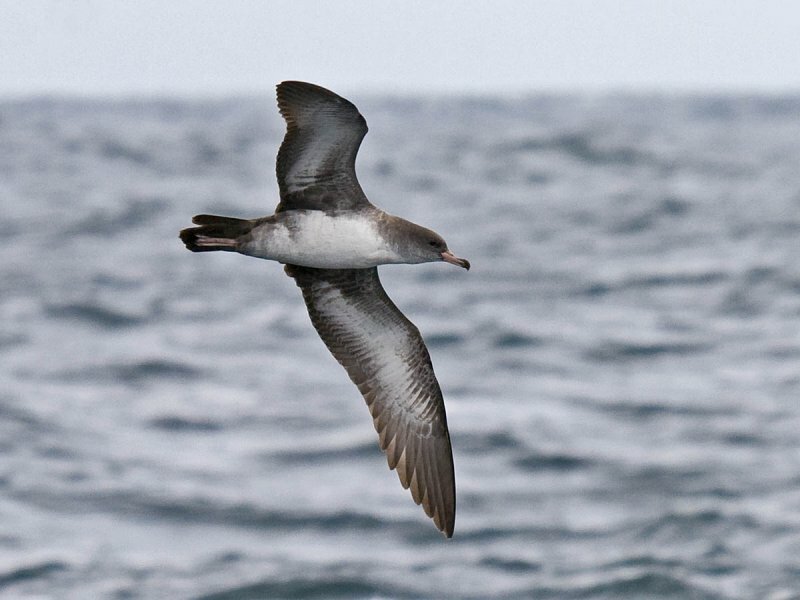 It was originally scheduled to chum for seabirds 25 miles off Newport, then head southwest 15 miles to 32 miles off Yachats, staying on the edge of the shelf where seabirds are most abundant. However, with this report, I have decided to chase the Murphy's Petrels and Parakeet Auklets by heading 45 miles straight off Newport to 500 fathoms and spending an hour in "cruise ship lane" waters there. We still expect to see all of the species from our original schedule, except for nearshore species (we'll forgo Marbled Murrelet search near shore, for example). 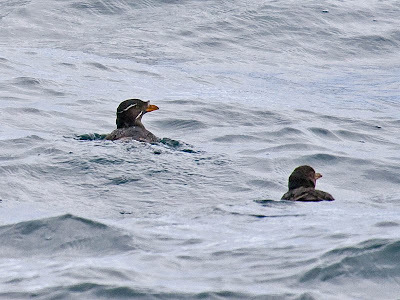 No guarantees, of course, but Parakeet Auklets are probably better viewed from the smaller boat. We have been out during this time on charter boats without seeing Murphy's or Cook's Petrels or Parakeet Auklets (we have seen Horned Puffins). But usually we only go 25-30 miles offshore to the edge of the shelf at 100-200 fathoms. The cruise ships always stay pretty close to 45 miles offshore from Newport. So we don't really know how close these birds may be. We'll spend pretty close to 5 hours in slope waters of 100-500 fathoms. I'd make this a 12 hour trip, but we only have 10 passengers right now (16 is break-even to pay for just the boat for 10 hours). But if we can get 5 more passengers I'll bump the hours up to 12. We'll still be going at a loss, but for 2 more hours of deep water birding, I think it's worth it! Cost will remain at $150 per person whether or not we decide to go for 10 or 12 hours. I have to let the charter know right away if I want to change the length, so contact me soon if you want to attend. As always, sea conditions (wave height and spacing) play a big role on whether the trip even departs. Last week we had excellent seas. This week is a bit rough, which would probably keep us from traveling fast enough to get out as far as we wish. The forecast for next Monday (4 days ahead--as far as NOAA predicts--and mostly unreliable) looks good again. Other species to expect: Black-footed and perhaps Laysan Albatrosses, Sooty, Pink-footed and perhaps Manx, Short-tailed, and Flesh-footed Shearwaters, Fork-tailed and perhaps Leach's Storm-Petrels, Parasitic, Pomarine, and Long-tailed Jaegers, Red and Red-necked Phalaropes, perhaps Arctic and Common Terns, Sabine's Gull, Rhinoceros and Cassin's Auklets, perhaps Tufted Puffins, perhaps Ancient Murrelets. Five more common Oregon sea birds. Here are a final five common Oregon sea birds. These are by no means the only birds you will see on a pelagic trip. Rather, you should expect to see most of the 15 species presented in these 3 articles on nearly every trip! 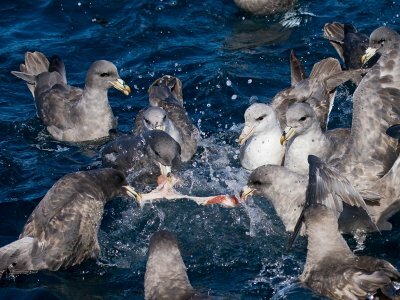 It is not unusual for first-time pelagic participants to see a dozen life birds--birds they have never seen before. Pink-footed Shearwaters are rather common, arriving in spring and remaining until winter. At times they approach within a mile of shore--especially early in the morning--but are usually found 5 to 30 miles offshore. 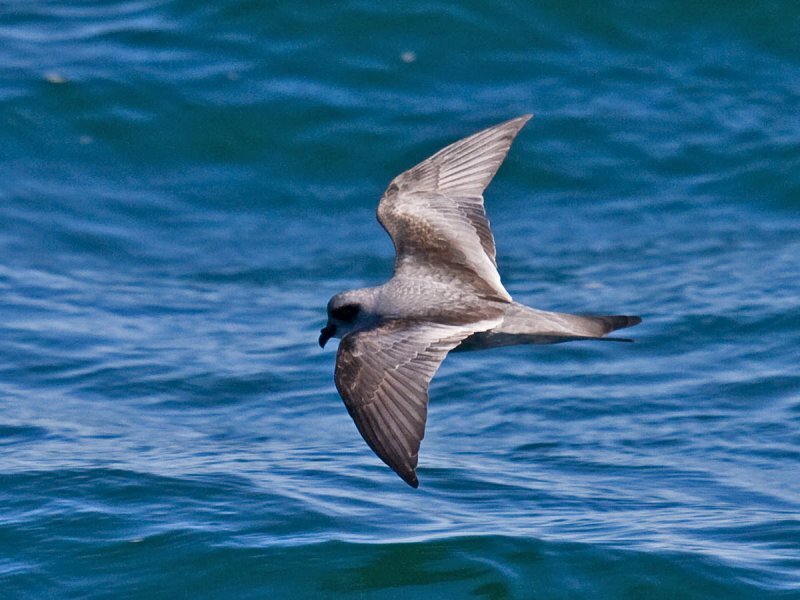 Fork-tailed Storm-Petrels are found spring through fall. They nest along the Oregon coast on offshore islands. 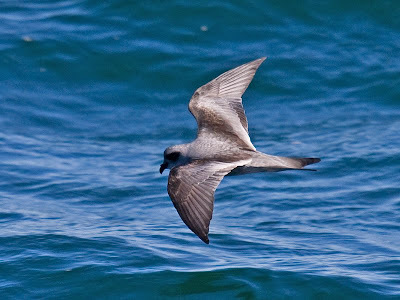 They remain in their nest burrows during the day, and only come and go at night, spending several days far offshore before returning to their nestling. Thus, very few people have seen these birds from shore. On our trips they are found from 10-55 miles offshore. Parasitic Jaegers are loners, harassing gulls and terns to steal a meal. This is the jaeger most likely to be seen from shore, especially in the fall when they may mercilessly chase small gulls, terns, or shorebirds just offshore before winging back out to sea. These can be found 50 miles offshore in migration, but are most likely to be found within 20 miles of shore. Common Murres nest abundantly on the Oregon coast. In summer they fly back and forth from their nest colonies--bringing a single fish to their lone nestling--where thousands of birds nest shoulder to shoulder on the tops of flat offshore sea stacks. They are usually found within 8 miles of shore, but in winter can be found out much farther. Most visiting birders to the Oregon coast have seen this species from shore. 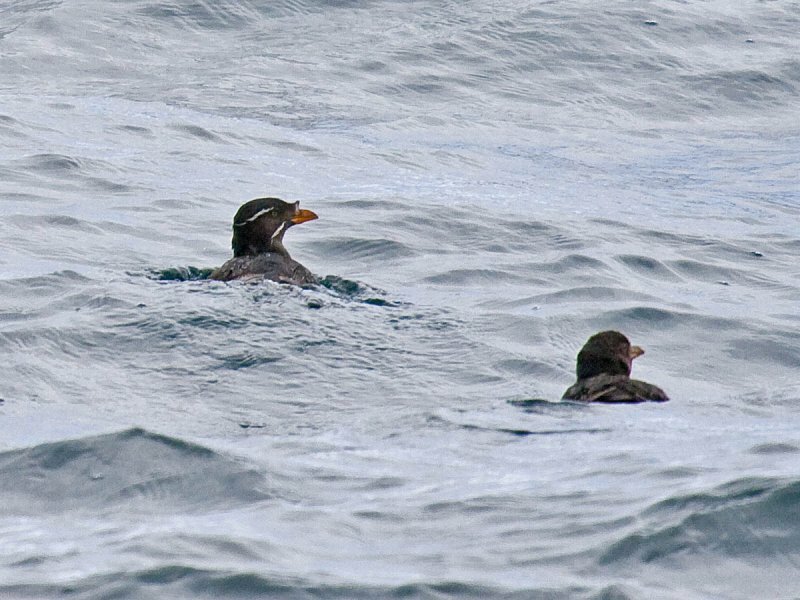 Rhinoceros Auklets are on the target list of visiting birders to the Oregon coast. These birds are found on nearly every trip from nearshore off about 20 miles or so. From certain headland locations with a powerful spotting scope you may see these birds from land. But these glimpses of distant birds bobbing on the water or flying away are rarely as good as the views on a pelagic trip. Come and see the interesting Oregon sea birds found offshore. 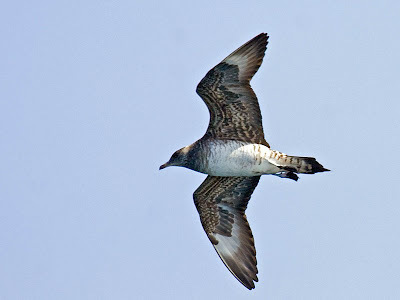 Visit The Bird Guide's pelagic birding web pages to reserve your spot to view Oregon sea birds. 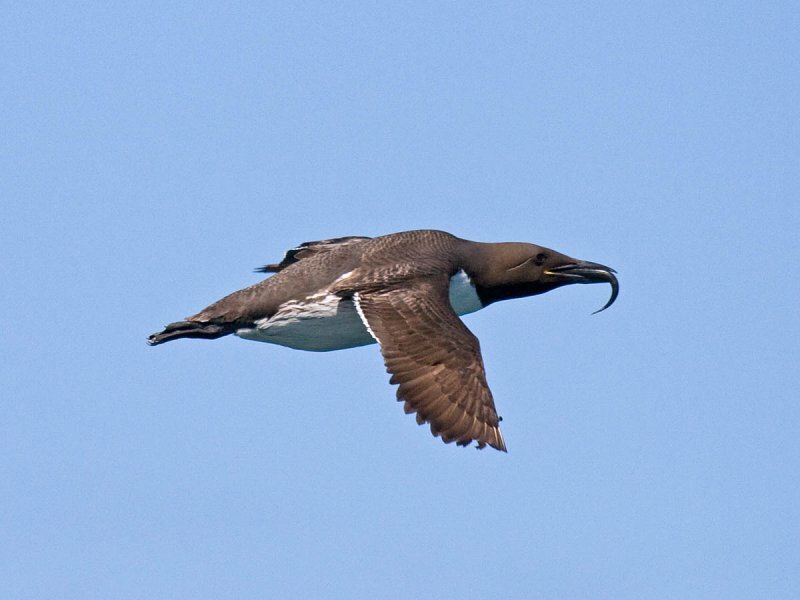 In order to attempt to reach a larger audience of potential pelagic birders I have created a Squidoo lens (http://www.squidoo.com/oregon-seabirds-pelagic-bird-tours). Squidoo is an eclectic online publishing and advertising site. But it ranks well in the search engines. So I thought I'd put up a page and select the keywords that don't already rank well for The Bird Guide Inc.'s web site. The goal is to find more pelagic birders for our trip, as we've had to cancel a trip already this spring for lack of signup. The one thing is, though, that in order to get submitted to the search engines it has to reach a certain level of internal traffic first. Like getting the experience necessary to get your first job, it is a bit of a Catch 22. So you have to promote it yourself for a while before it catches on. This is my attempt. Take a look if you're so inclined and let me know what you think of Squidoo or my lens there. Here are five more common Oregon sea birds that you will very likely see on your next pelagic trip. Northern Fulmars are gull-like tubenosed sea birds. They are common from early fall to early spring. Though sometimes seen from shore in late fall, they are most often encountered more than 20 miles offshore with the albatrosses. 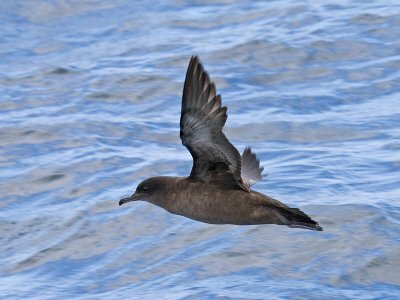 Sooty Shearwaters are Oregon's most abundant sea bird. They arrive in March and remain through October. They may sometimes be seen feeding on bait fish near shore and from shore, even within the mouth of the Columbia River. Usually, however, most birds are between 5 and 20 miles from shore. Pomarine Jaegers are the most frequently seen of Oregon's jaegers. They are common spring and fall migrants. Often seen singly, they are most common from 10-25 miles offshore, where they harass smaller birds into giving up their most recent meal. 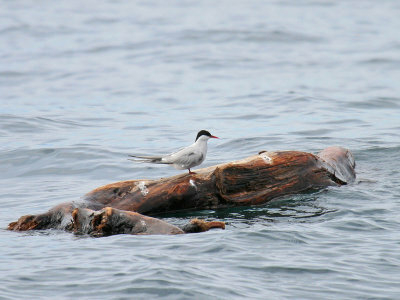 Arctic Terns migrate far offshore, usually over 20 miles from shore to hundreds of miles offshore. This keeps them out beyond most of the bigger Pomarine Jaegers and gulls. They are rather rare in late spring, and uncommon from July to mid-September. 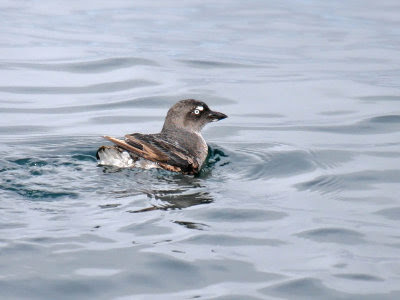 Cassin's Auklets are found from near shore to about 25 miles offshore. A few nest along the Oregon coast, but they are most common from August through March. 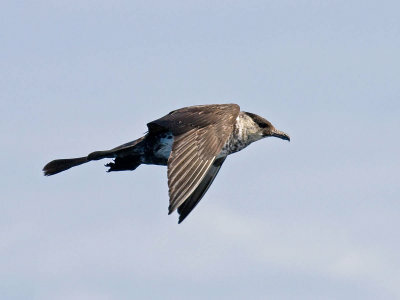 Visit The Bird Guide's pelagic birding web pages to reserve your spot to view sea birds in Oregon. A new article by Abe Borker on NatureScapes.net discusses the challenges of pelagic bird photography. One of the topics Borker covers is the challenge of finding powerful compositional elements other than birds flying against the empty sky or sitting in the water. Breaking waves, other birds, the rising sun, or landscapes at the horizon can all add to the artistic appeal of your photographs. He also suggests trying extreme close-ups as a way to add variety to your photography session. Choose a trip for your next pelagic bird photography session!